King Kuka was born and raised on the Blackfeet Indian Reservation in Montana. He was a full-time professional artist whose art has been seen internationally. He worked in watercolors, oils, bronze, steel, silver and gold. 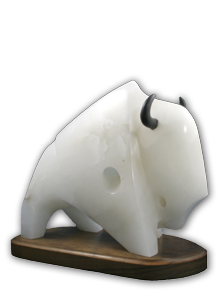 His art reflected his dedication to native people and their spirituality. King earned a bachelor degree of fine arts at the University of Montana, Missoula. He studied mainly painting and sculpture. His wife and five children are active in the arts as well. Art was not a simple pastime, but the spiritual essence of his life. A strong creative mind rises up to meet challenges and so it was with King. In the time before settlers, vision quests were made by his people. Kuka’s quest was made, and he found his creative spirit. Kuka believed in dreams, the vision kid, the night dreams and the distant one. “Dreams are invisible voices calling me, sustaining me, carrying me in difficult times,” he said.